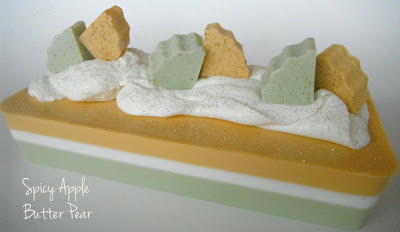 Have you seen the Color Palette Soap Challenge that Erica at Bath Alchemy has been hosting each week? I chose to use MP, simply because I only have a limited amount of both fragrances, and also because melt and pour soap is so predictable. I knew that the colors I made were the colors I was going to get. This was just a short and sweet Sunday project, but I'm really happy with the way it came out. If you are interested in participating in the challenge, hop on over to Erica's blog! Gorgeous, Cee Gee! Your soap looks like autumn, and I'll bet it smells great, too. I love the whipped M&P on top. Bravo! Thanks so much! The fragrances do compliment each other very nicely...it makes me want to bake an apple-pear tart! BlueHost is the best web-hosting company for any hosting services you require.